Back home in Michigan he put together a five-piece blues band called “Justice” with drummer/vocalist Paul Moore, Prentice Danzy, vocals, harmonica & percussion, Tommy Johnson on guitar and Johnny Hammond on bass. They started renting halls and putting on their own concerts, eventually buying an old barn and calling it “Fat Boy’s Coffeehouse” where they could play all they wanted, whenever and whatever they wanted. It was an incredible experience with some great jams and total freedom to improvise and test new ideas. Jimmy went on to explore other genres and instruments (fiddle and mandolin), and has continued to play the region to the present day. He went through several phases: Rock, Folk, Roots Country, Blues power trios, and acoustic duos. 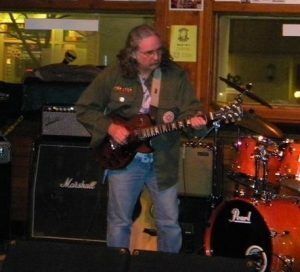 He had a successful blues-rock band (The Mere Mortals) in the late 80s, a four-piece powerhouse band with his brother John on bass, Denny Anderson on drums, and keyboard great, Dave Cleveland. They were a hard-working band, often playing five or six nights a week and traveling all over Michigan in an old beat-up Ford station wagon loaded down with gear and exhausted band members.